Do you like challenges? Then we challenge you to Draw everything with only "One touch". This game will baffle your mind, for it is not always so easy to draw a shape without lifting the finger and without retracing the same line. The One-Touch Draw free puzzle game challenges everyone & trains your brain whether an adult or a kid with its one-stroke puzzling strokes. It amazes you with its shapes & puzzles level after another, whilst you keep joining the single color dot cubes in one line and in one stroke making the dots glow when drawn quickly in succession in matching sequence. Follow the rules, draw the shapes, have a time of your life!! 1. Play six different modes with 600 difficult & addictive levels in the game, but remember each one is as much challenging as the last one. 2. Move your finger on the shape shown on your mobile screen. You will learn why elders said that one must not drift away from his path. 3. You must not lift your finger. Lifting the finger will end your game. Just keep moving it along the lines. 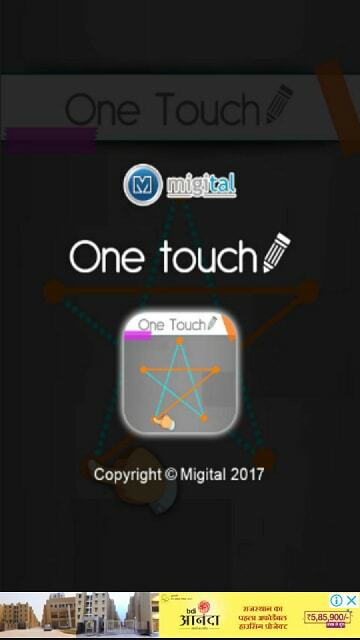 OneTouch is also called Un-Toque and 1Touch Draw in different game sequels presented by Migital. Amaze yourself, improve your brain, IQ and coordination, concentration, and train to focus well. You will enjoy this easy-to-play game, will have loads of fun, and your kids will love it too, while they play-and-learn from this brain puzzle game. It is also great for the eyes, as it is a mono-color dot game, unlike many other one touch puzzle games that are too color stricken. The urge to draw the shape and connect the right dots within given time is something that will keep you up at nights if you have the dare to take challenges and complete them too. With more than 600 unique level, One Touch is your way to engage in something worthwhile, something that not only makes smarter and faster but will it actually makes you addicted to challenges by bringing fun challenges in your daily boring life, fill your empty time with finally something that pays off. 1. 6 amazing modes of gameplay: Make your gaming experience more brainy and smarter as we have made 6 different levels that you would actually love to play, they will make you scratch your head, make you go crazy to solve the puzzle in one go. Enjoy 6 various modes which will make this game altogether a much more addictive experience for you. 2. 600 levels to enjoy for hours in the run: A game like One Touch which not only is damn too exciting and awesome but also makes you smarter, forces you to push your thinking skills further ahead must never end. Enjoy the unlimited fun with more than 600 levels that keep you glued to way to becoming smarter. 3. 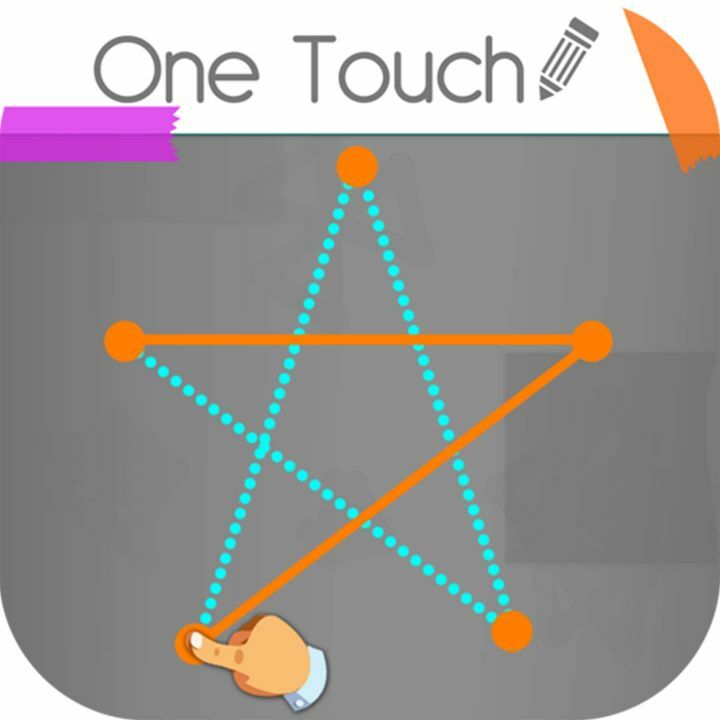 Addictive & Mind Baffling Game: One Touch is an example that becoming smarter, sharper and intelligent can actually be fun and addicting. This game is your chance to become the ultimate game master that actually has super mindful tacts and skills to deal with the most challenging tasks and win them too. 4. No two shapes are same, each one comes with a unique level of difficulty: As One Touch is a game of connecting the dots and making the figure in one go, it is very important that no two shapes are same, what would be the logic behind making so many levels otherwise? Enjoy the game with all new and unique challenges and 100% genuine levels. 5.. Warm Up - Play 100 different levels in the 'Warm up' mode. It will be easy just to get you into the groove! These levels are specially designed to introduce you to the game as the challenges grow tougher and more challenging. Learn slowly how you can make shapes in one touch by connecting dots quickly. 6. Warm Up Timer: It will keep getting interesting with each mode. 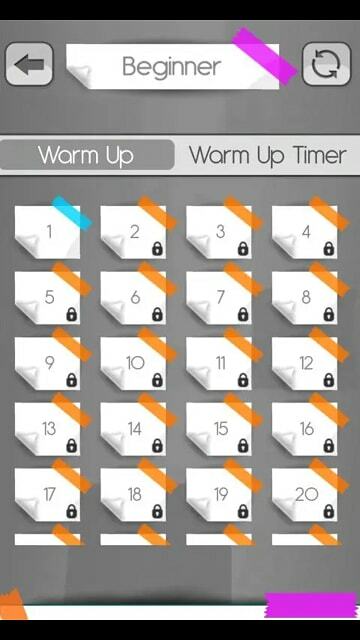 Rules are the same as the previous one, you just need to beat the timer in the 'Warm Up Timer' mode. Warm time is made you make respond more quickly in a limited time frame, it is your call now on how to beat the time and finish the target of making the shape. 7. Dots to Dots – In this mode, you may think it is easier as the shape is already shown. But you'd just be fooling yourself if you thought it was easier! ;) You may have the shape, but still, you need to find a way to create a shape with one single touch, so it is still equally challenging and exciting at the same time. 8. 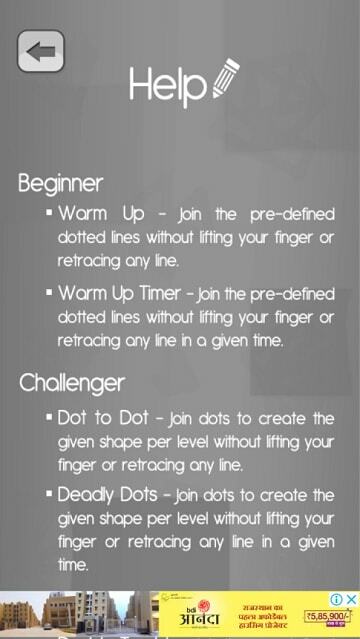 Deadly Dots – Finish the shown shape before the time runs out! So in a way 'Deadly Dots' is just like 'Dots to Dots' but DEADLY! You need to finish in time. 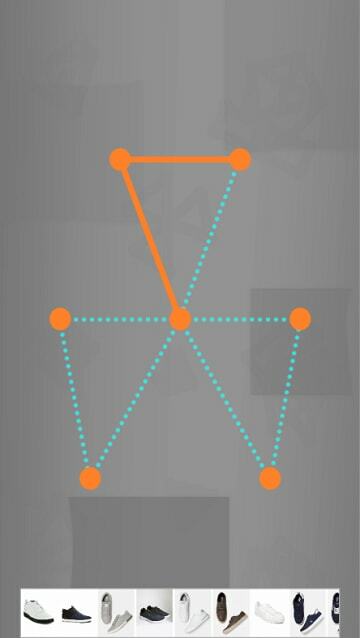 Do whatever it takes to make the shape and connect the dots in the right way in the given time and beat these deadly dots with your clever moves. 9. 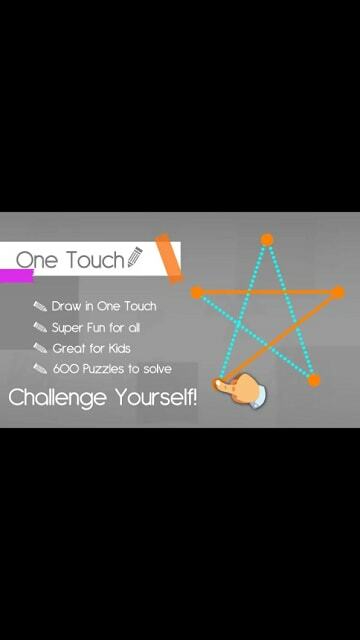 Double Trouble – Let's get a twist in the game, now you won't be tracing the shape just once. You will have to trace the Redline twice or your game will be over! Be clever, some paths are worth walking twice. 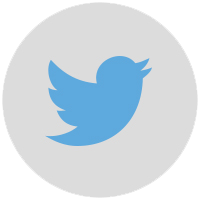 ;) Test your concentration and focus level as it is all that matters here, do it once and do the same again, sounds easy? Try it out once yourself and let us know for sure. 10. Time Trouble – We all know time is an enemy! Even in the games that we enjoy so much! Although you need to beat the time once again but stay assured it's going to be even more fun than any of the modes above! The suspense of completing the shape in time is the real challenge here, then the shape itself is too difficult to finish in One Touch. 1. How to change the language in One Touch game? 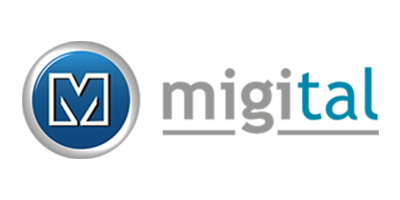 One Touch game is available in all top 16 different languages so that you can easily play One Touch without having to worry about the language barriers. 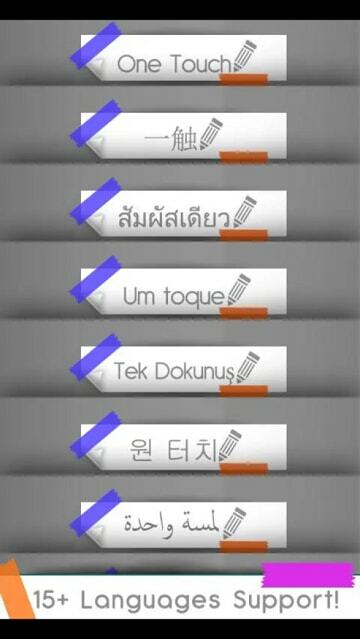 To change the language, go to the flag icon in the main menu and choose your preferred language. 2. How to get hints in One Touch Game? Stuck in difficult levels? Need some help? Don't know how to draw a shape without getting trapped? You can always use the hints given to you at every level but remember these are just the hints, not the exact solution, you have to work it out on a solution yourself. Click on the bulb icon to get the hints in a level. 3. How to view the number of hints left and the stop timers? Well, the hints are a good thing, but the only bad thing about them is that they are limited and hence you have to use them wisely and precisely, you must save them for extremely hard levels. 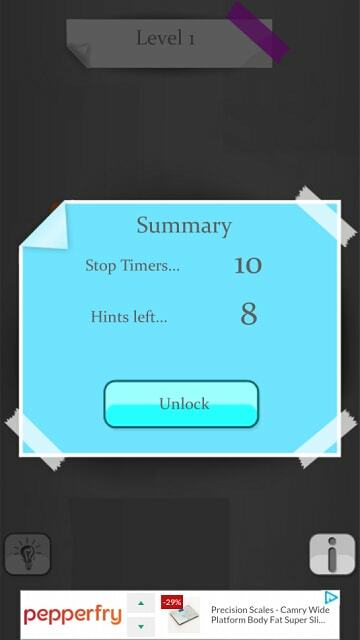 To view, the summary of the hints and timer click on info icon during any level. 4. How to play in timer mode? 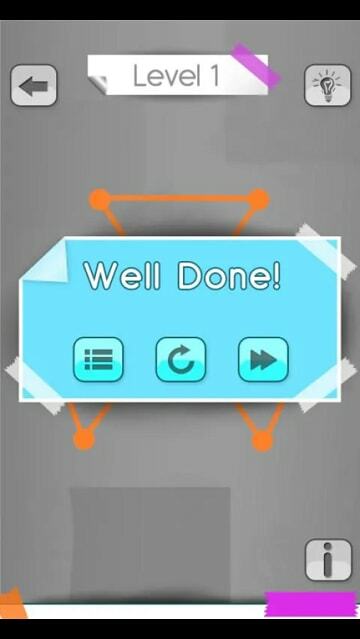 You can play warm-up levels in the timer mode as well, it gives you the challenge to complete the shapes in a given time frame and thus you have to act really fast to connect the dots in one go. To play in timer mode, go to Warm-Up modes and select the warm-up timer from there. 5. How to turn off the music and vibration? To turn on/off the music, go the main menu, click on the settings button. You can choose to set the sound settings as per your desire from the menu. Save the settings before exiting and your music and vibration preferences will be saved from there. 6. 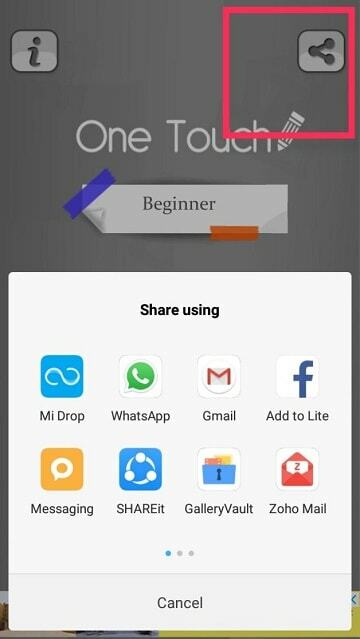 How to share One Touch game with others? We will be grateful if you share your heartfelt and fun experience of playing One Touch game with your friends and family, it took us a lot of hard work to create a unique gaming experience for you. 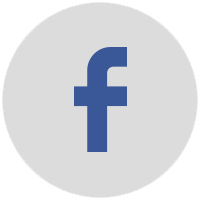 To share this game, simply click on the share icon from the menu and spread the word about it everywhere. 7. How to get more powers and hints in One Touch game? You can get more powerups and hints in case if you run out of them and you desperately need them. To get more hints, go to the bulb icon at any level and select the unlock option, from here you can unlock more hints to keep the game playing. 8. How to find more fun games like One Touch? 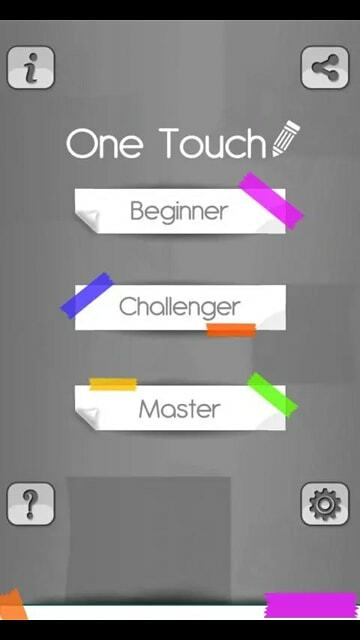 Brought to you with love by the Team Mig Super Games, One Touch is a puzzle and brain-storming game which makes you think and plan harder to solve the puzzles in one go. Draw the objects by connecting the dots without breaking the flow aka do it in the only touch. Download and play this game with more 650 levels filled with unlimited fun and head-scratching puzzles. Want some more useful Gaming Apps? Try Hide & Seek for your Android/Apple phone now.